Domain name registrar provides additional Whois data that could help you identify domain buyers. Last week Alvin Brown published a tutorial on how to get Whois search counts for your domain names at GoDaddy. This data can be helpful when considering the value of your domain names and potential buyer interest in them. Rob Monster, who runs the domain name registrar Epik, commented about the approach Epik takes with Whois data and I found it interesting. Then you can view the actual IP addresses of Whois searches. Think about how this could be helpful: you receive an anonymous inquiry for one of your domains and you’re trying to figure out who the buyer is. Take a look at recent IP addresses and they might tie back to a particular company. This is a unique value-add and fairly innovative. This is one of many value-added features that customers find on the Epik domain management platform. This particular feature has been around for years though only the savviest customers are making use of it. I believe its diagnostic value is high for managing decisions on which domains to keep. It is also helpful when deciding to accept a good bid that is not great versus running a competitive bidding process. 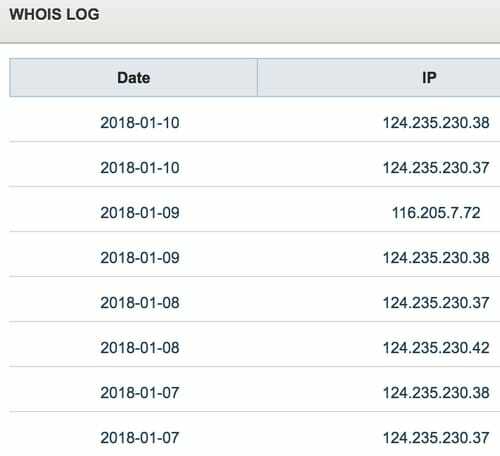 The WHOIS logs are the kind of data that some registrars hold back for their own internal analytics around drop management. We feel that practice would violate a core operating tenet of the company vis-a-vis transparency. Hope to see you all at NamesCon. I am scheduled to speak at the Roundtable brunch event on the last day. However, the Epik and DigitalTown teams will both be on site and will be eager to meet with folks from Saturday onwards. just FYI, Fabulous has always offered this as part of their platform. I havent used Epik to know what else they offer.. I really like Epik. Good stuff, good people. Are you kidding me? LOL, I’m so embarrassed. All this time I never knew the numbers were clickable to reveal that. I thought it was all just the color coding and the three kinds of popup notes. Same here! never tried to click it, just hovered it and saw the data. Yeah, but Rob Monster, a domainer, gets to see all your searches….LOL. Not too smart. Second, what are you talking about, what searches? That you happen to look at this cool tool available in the account for domains you already have there? If you are talking about searches for available domains, I never use any registrar to search for domains, unless I know I will register it right away, and I seriously doubt most of us who frequent these blogs and the guys who publish these blogs do either. It doesn’t matter who is into what – if you’re using a registrar’s interface to search for available domains that is not smart. Otherwise I have no idea what searches you could be referring to that would be so bad for anyone involved with providing the service to see.